Did You Die is a mixed gender indie band with its members split between Victoria and Vancouver, BC. The band’s music blends shoegazer dreamlike atmospherics, buzz-saw postpunk and head-drilling psych rock. Floating just above the guitars are the ethereal vocals of Richie Felix Alexander (vocals, guitar) and Katherine Kovna (vocals, guitar). The band is rounded out by bassist Roz Jeffery and drummer Ian Browne, known best for his tenure in the Matthew Good Band. In late 2015 Did You Die released a cassette titled “Weird Love” on Wiener Records. The tape found its way into the hands of John Kastner, (of Doughboys fame) who excitedly had Did You Die open for Swervedriver in Vancouver. Shortly after that, Did You Die was invited to play the highly touted Levitation Festival. Since then the band has shared the stages with the likes of Nothing, Sunflower Bean, Yuck, The Lemon Twigs, No Sun, Frankie Rose, Winter, Lume, LSD And The Search For God, Sianspheric, Mystery Machine and Wrong, to name a few. In October of 2018 Did You Die released their debut album, ‘Royal Unicorn’ on Blew//Rose. The album was made available on vinyl, CD and digital format. ‘Royal Unicorn’ was produced by Felix Fung (Chains Of Love, Spectres) and engineered by Jordan Koop (Dead Soft, The Courtneys). The band completed a national tour of Canada in October and November of 2018. 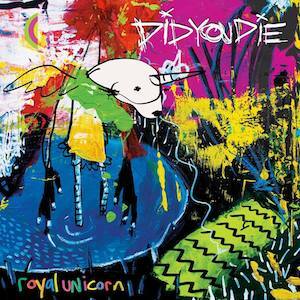 In December, ‘Royal Unicorn’ hit #1 on Canadian college radio charts nationally. They released two videos from the album: ‘Til The Morning Light’ and ‘Channel Swimmer’, both receiving over 20,000 views on YouTube. By December of 2018, the band’s Spotify account drew more than 13,000 monthly listeners and 5000 followers. The band will embark on a US tour in April and May of 2019, including a stop at Seattle’s popular Seagaze Festival. June will see the band return north and complete another national tour of Canada. In addition, Did You Die is short listed for various major festivals slated for later this year.